Bills head coach Doug Marrone is the type of coach that has his head down and is moving forward. So when he arrived home on Monday it was his young son who informed him that division rival New England had signed free agent QB Tim Tebow. “I did hear that,” said Marrone when asked about the Tebow signing. “My son told me that because I was out last night. I don’t think anything fascinates me in this profession. I’m one of those guys that have been kicked around a lot so I’ve always appreciated the fact when someone has an opportunity to make a team and go play whether it’s Tim Tebow or Tarvaris Jackson. Marrone played for a handful of NFL clubs before entering the coaching profession. Jets to turn to read option? The Bills have had their share of trouble with the read option game the past two weeks with Seattle working that part of their offense very effectively and Miami getting some positive plays out of it as well against Buffalo in their victories. The Bills last opponent of the season, the Jets, arguably have one of the better read option quarterbacks in Tim Tebow, but will they make use of him Sunday? Head coach Rex Ryan didn’t use Tebow in their Wildcat package last Sunday because Tebow asked not to be a part of that package. That according to ESPN New York. Slot receiver Jeremy Kerley was used instead in the Jets’ 27-17 loss to San Diego. That same report indicates that Tebow and Ryan have since smoothed things over. On his conference call with Buffalo media, Ryan was asked in light of the recent success of the read option against Buffalo if he would make use of it, be it Tebow or Kerley. “Obviously you’ll look at things that maybe have worked against an opponent or whatever,” said Ryan. “A lot of things go into it. We played that Seattle team and you can say the same thing: they had success running it against us running that so we’re certainly going to prepare for it as well. When you look at what Seattle has, they have a lot of things that are hard to defend. They’ve got the receivers, the quarterback — and he can do different things. Could we possibly do it? The answer is yes and we hope they spend the majority of their practice working on it. Jets head coach Rex Ryan has insisted that they will use their version of the Wildcat package with Tim Tebow this Sunday against the Jets, despite not revealing any of it in the preseason. While Ryan is confident in the package with Tebow, he’s not sure it’s going to neutralize Buffalo’s pass rush. “I don’t know about that,” Ryan said on a Wednesday conference call. “With Super Mario over there, that’s gonna be tough. There’s no question. Clearly this team can really rush the passer. They added Mark Anderson as well, and the other guy too that I always think is underrated is Kyle Williams. We voted him to the Pro Bowl when he was healthy. I’m happy for him to see him back out there, but I wish he could have waited a week because he is a tremendous player. So that pass rush is definitely going to be tough. As we move into Week 1 the Jets become the focus, but they’ve been the focus of the Bills in practice since last week. A familiar division opponent the Bills know what they’re in for facing New York on the road Sunday. Buffalo is practicing later today (2 pm) to get a head start on the practice week. We’ll have full coverage on Buffalobills.com. In the wake of the Jets’ acquisition of Tim Tebow, Bills GM Buddy Nix during an appearance on SiriusXM NFL Radio Monday was asked what he thought about Tebow now being in Buffalo’s division to face twice a season. Here was Buddy’s response. With Tim Tebow now in the AFC East, he’s unlikely to be the starting quarterback when the Bills face the Jets, but even if for some reason he is Buffalo has last year’s success against him to go on. Appearing on the radio in Austin earlier this week after taking in Texas pro day, Bills CB Aaron Williams was asked about his rookie season and specifically about the interception he had in Buffalo’s 40-14 win over Denver with Tebow at quarterback in Week 16 last season. Tebow was 13-30 passing for 185 yards and ran for a touchdown. He also had four interceptions and was sacked three times including one sack that led to an interception return for a touchdown. The Bills cornerback also said he was excited to see free agent Mario Williams was visiting Buffalo and took to twitter to encourage Bills fans to show Williams how welcoming Buffalo can be. The New York Jets have pulled the trigger on a trade for Tim Tebow putting him in the AFC East. New York parted with a fourth and sixth round pick for Tebow and a seventh from Denver. It’s widely speculated that Tebow will be utilized in much the same way the Jets used Brad Smith, who is now Buffalo’s multi-dimensional threat. Should make Jets week interesting twice a season. Why are they forgetting Brad Smith? As speculation begins about where Tim Tebow might be traded, just about every national writer has Buffalo listed as a team that should consider acquiring him. The problem is they’re forgetting about a guy on Buffalo’s roster that already does what Tebow does and more. SI.com’s Peter King is one of many national writers to list Buffalo along with Miami and Green Bay as landing spots that make sense for Tebow. Here’s what he wrote. I would also go after Tebow if I were Buffalo. Not to take Ryan Fitzpatrick’s job, but to create the kind of offensive choices in a gameplan Chan Gailey has shown over the years he does so well. Gailey was the idea man for much of what Kordell Stewart became in Pittsburgh early on, the versatile “Slash” that, if the Steelers had been smart, they’d have stuck with longer than they did. I respect Peter King’s work a whole lot, but Buffalo signed Brad Smith in free agency last year to run some Wildcat, convert short yardage situations, play some receiver and return kicks. He also throws a better ball than Tebow. Here’s what Chan Gailey had to say about Smith earlier this offseason in terms of his outlook for him in 2012, with the benefit of a full offseason to properly incorporate the multi-dimensional threat into his offensive playbook. I spoke to Smith last week, who is just about done with rehab from an offseason surgery. He said he’ll be ready to go in about another week. We’ve seen the running quarterbacks in this league mandate a spy defender with the great potential of them taking off for big time yardage. But with Denver’s Tim Tebow, Bills head coach Chan Gailey says the traditional spy doesn’t apply. Tim Tebow (610) leads the NFL in rushing among quarterbacks as he has a one-yard on Cam Newton (609). At 6’3″ and 235 pounds Tebow also is built like a running back and Buffalo’s defenders know he’s not afraid to deliver a hit or take one when he’s off and running. “He’s a guy that can spin and shake out of tackles. he’ll lower his head, he’ll try to run over you,” said Chris Kelsay. “He’s a running back at the quarterback position. In their empty sets, they will get all the running backs out of the backfield and run typical running plays with him as running back. Linebacker traps with the quarterback running the football. He’s a guy you have to swarm and get a lot of hats on. Bills DL Marcell Dareus has been on the winning side of the ledger when facing Tim Tebow in his past, most notably in the 2009 SEC Championship game en route to Alabama’s most recent national title. As we profiled on the home page at Buffalobills.com, Dareus has other motives against Denver this week, but facing Tebow again is a bonus. Dareus was almost disappointed that New England beat the Broncos last week. He sounded as if he wanted to face Tebow on a seven-game win streak to try to break the run. 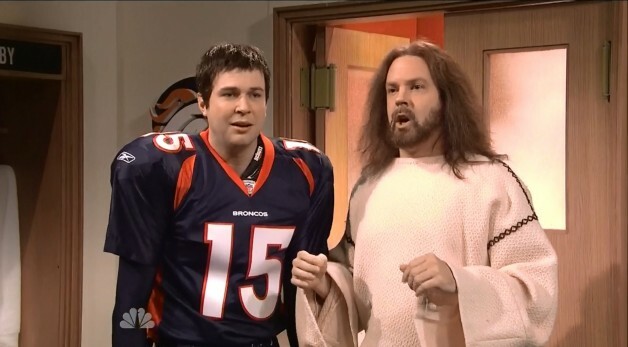 It was the last sketch on Saturday Night Live last night, so perhaps you missed it, but Denver QB Tim Tebow, who along with his Broncos teammates will be in Buffalo next Saturday, was spoofed on SNL as he had an encounter with Jesus Christ after his most recent victory over Chicago. The best part was perhaps the crack about Tom Brady and Bill Belichick knowing they play the Broncos today. Well Bills fans for the most part the news has been positive for football of late. Keep your fingers crossed. In the meantime let’s get to your questions and Happy Father’s day to all you dads out there. Any updates on Michael Jasper? The last it seems we’ve heard from him was all of the post-draft stuff. I’m curious if he’s continued to drop weight and he’s now below 377. I’m curious how his strength and conditioning are going to. CB: Unfortunately with no contact between the team and the players during this labor situation there really are no updates. Based on what I’ve read from local newspapers in Tennessee online, Jasper has been working out in Georgia and Tennessee and sounds committed to coming to Buffalo in the best shape of his life when we get back to football. I was wondering how the teams are able to keep selling the jerseys with the players names on it. Doesn’t the lockout make it illegal? Or is there some kind of exception to the rule. Also, if the lockout is still in effect, what’s the plan for the uniform unveiling? Usually we see several players in full uniform. Will the alumni be dressed up in full uniform to unveil the new uniforms? CB: I’m not going to pretend to know all the licensing rights with respect to the jerseys. The league incurs the cost to have the jerseys produced and the players get a cut for the jerseys with their name or number on it that are sold. I can only guess that remains intact despite the labor situation. As for the plan for the jersey unveiling, you’ll have to just wait until the 24th. Sorry Mike. How do unrated rookies and free agents get on a team like a non collegiate player trying to make it like Kurt Warner and what’s an NFL work out regiment consist of? CB: As you mentioned they’d probably have to work out for a club at this point and if the team is interested enough they’ll sign them. Most NFL workouts vary by position. A defensive lineman for example would go through different drills from that of a defensive back, as you often see at the NFL combine if you’ve watched that coverage. No longer is there NFL Europe for players to further develop like Warner did, but there is the UFL and CFL where some younger players can hone their skills in the hopes of making their game attractive enough to NFL franchises. In your opinion, who will be the two starting tackles at the beginning of the season??? CB: I think barring any major player addition leading up to the season that it will be Demetrius Bell at left tackle and Erik Pears at right tackle for the 2011 season. Obviously the Bills coaching staff will have a lot more to say about that than I will. I was wondering that since the Bills don’t have their franchise quarterback, what do you think the chance of the bills trading for someone like Tebow? I mean especially if the Broncos don’t think he can win than do you think the Bills will try him? He’s a winner and I think that he will be good. So do you see anything like that happening within the next two years? CB: I’m not a mind reader so to know what the plan is by the Bills front office with respect to the quarterback position long term is impossible. We do know based on their comments leading up to this past NFL draft is they’d like to get a prospect or player that can capably fill that position for the next 8 to 10 years. I believe they really want to see how far Fitz can take them now that he’s the entrenched starter and has the benefit of the system under his belt for a year. They believe he can get them to the playoffs and win in the playoffs. 2011 will go a long way in confirming whether that is the case. So essentially it’s a wait and see. As for Tebow, the guy is not available. The quarterback that’s available in Denver is Kyle Orton, not Tebow so I don’t think he’s a realistic option for trade. Bills GM Buddy Nix told Buffalobills.com on draft weekend that Tim Tebow was never in their plans. On Thursday during an interview with Double-X 1090 radio in San Diego he explained why. When asked if the Bills had ever considered Tebow as a possible draft choice early he stated that they did not, citing what he felt was likely to be a developmental process to make Tebow NFL ready. Whether it was round one or round two, Buffalo did get a pair of players that figure to be early contributors in C.J. Spiller and Torell Troup. Both are expected to be on the field a good deal as rookies in 2010. There are reports that the Bills were “heartbroken” when Tim Tebow came off the board to Denver in the bottom of round one, but nothing could be further from the truth. In an exclusive one-on-one interview with Buffalobills.com, Bills GM Buddy Nix stated in no uncertain terms that Tebow was “never in their plans.” Here is his direct quote. Speculation will be rampant as to who the Bills were trying to get in the bottom of round one. My suspicion is DT Dan Williams was the mark, who ultimately went to Arizona with pick 26. For the full exclusive interview just go to the media lounge at Buffalobills.com. NFL draft prospect Tim Tebow has decided not to attend the NFL draft in New York Thursday. That according to NFL.com’s Jason LaCanfora in his latest twitter post (see below). JasonLaCanfora Tim Tebow will not attend the draft in NYC. He’s returning to Jacksonville but NFL Network will have a camera crew there with him. So although Tebow will not be in NYC you can rest assured that wall to wall Tebow coverage during the draft will be in full effect on NFL Network.